Home / Windows / What is Windows Defender? Windows Defender is a free protection program provided by Microsoft. Windows Defender will protect your computer from Virus, Malware, Spyware, or any other malicious programs. Windows Defender is previously known as Microsoft AntiSpyware. Like any other, installing Anti Virus software alone will not help much without updating your operating systems. Make sure you always update your Windows for critical patches. Windows Defender can be installed on Windows XP and Windows 7, for Windows 8 and Windows 10 it automatically installed unless you installed another anti-virus software. How to Open Windows Defender? 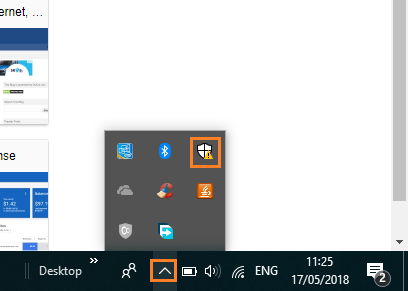 In Windows 8 or 10 in the right bottom click up arrow icon to expand taskbar, then click white shield logon (Windows Defender Logo). Windows Defender Security Center will open.